As steady work continues on the Statistical History, frustration at years of poor record keeping continues to grow. A fortnight ago, I visited the State Library to check out some old VSF Annual Reports they had retrieved from storage for me. Unfortunately rather than ordering all the years I'd requested all I got was that for 2000, and I had to re-order the others and go back a week later. 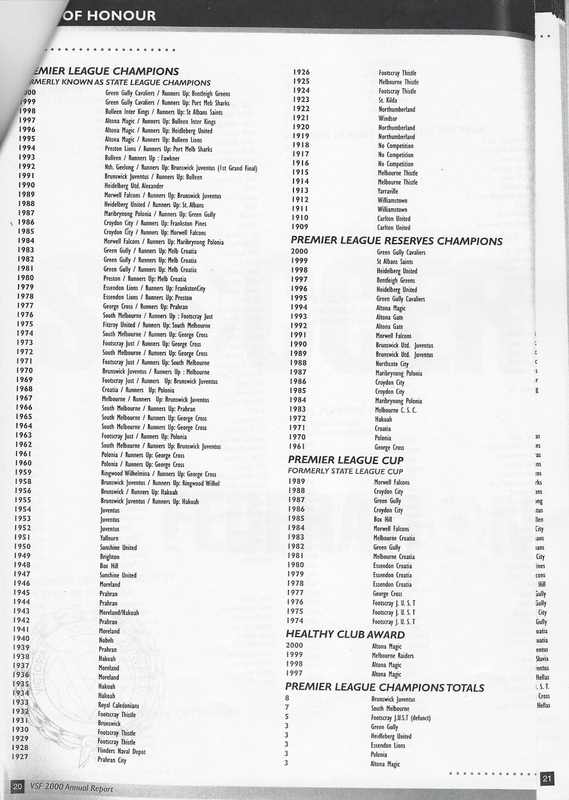 The good news was that in the 2002 Annual Report I was able to find the missing State and Provisional League Best and Fairest Award winners. As well as the missing reserves league champions for that year. The 2000 Annual Report had already given me the missing reserves league champions for that season, with full final tables no less! The Annual Reports generally have reports from the President, CEO etc at the front, a Roll of Honour of past champions and award winners in the middle along with lists of that season's award winners and champions plus state team achievements. At the end are financial reports. What I found odd was that the 2000 Report had all final tables, yet the 2002 one didn't. Given that the VSF had ceased producing a Yearbook in 2000, I would have thought it may have been the other way around. With no Yearbook to record the final tables in, they should have been in the Annual Report. A lack of foresight from those at the VSF at the time, who obviously assumed their results system would still be operational and functional in the years to come rather than dead and holding so much data in it's grave. The foundation of my research began with the Rolls of Honour in the mid-1990's VSF Yearbooks. I added to this by visits to the State Library to check out the major daily newspapers and The Sporting Globe on microfilm in the Newspaper Reading Room. Then came the internet and OzFootball and later Socceraust. Trove then made going through old newspapers so much better, with a search function that covered what winding through whole newspapers on microfilm in a darkened room may have missed. So when I look at the Roll of Honour in the 2000 VSF Annual Report, I can't help but be a little angry. 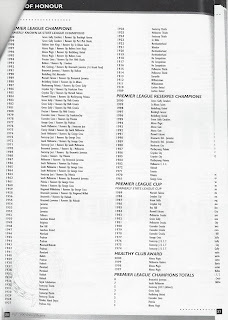 Look at that list of PREMIER LEAGUE RESERVES CHAMPIONS. 1983 and then nothing until 1972. 1970 and then nothing until 1961 and then nothing before that time. Now 1973-1982 is hardly ancient history. How come no-one with any sway was able to say that this was not good enough and try and improve this sad neglect of history? A bit like the version of the FFA Hall of Fame on their website, can such an embarrassing record of history really be labelled a "Roll of Honour"? Where is the honour? All is see is disrespect. At this point in time I'm one or two years short of being able to extend that lineage all the way back to WWII, and with around 80% of the reserves champions before that also established. The FFV, meanwhile, no longer even bothers to maintain a Roll of Honour, they have in fact gone backwards. Similarly incomplete was the list of top flight leading goalscorers. Pre-1970 all that was listed was 1969, 1967 and 1963. Wouldn't it be great to see if the current four time consecutive champion, Milos Lujic, was the all-time record holder? I've been able to add 1960, 1962, 1965, 1966 and 1968 to that list, as well as large chunks of 1930-1941. Looks like the great Frank McIver was top scorer on 5 or 6 occasions, so Millsy will need to keep on banging them in for some time to come to catch up. Just to put the lack of records in the 1960's and 1970's into perspective, I've been able to complete a record of the "Local International" played between 1908 and 1937. Complete, and almost with line-ups, the major issue in that regard being the newspapers of the day only using surnames (no initials) and possible various spelling differences actually being the same person needing to be clarified. Once that's worked through, I'll be able to list everyone who was "capped" in these games. The data is there though. As it is, the local international was contested annually bar for some years during WWI and 1910 when it was held twice (possibly because the 1-1 draw in the first game was an unsatisfactory result). Some reports state it began in 1909 with the first organised league, but there was a contest in 1908 that I've included in the records. There are also selected teams for the 1884-1886 versions, but for some reason no results found for those games. The home of the local international was the Fitzroy Cricket Ground, which held 12 contests. The Motordrome was used 4 times, as was it's successor Olympic Park. The fields at Middle Park were utilised 3 times, with the Exhibition Oval used twice and a single event held at East Melbourne Cricket Ground. In the end, honours were even. Scotland had 11 wins, England had 11 wins and there were 4 draws. The Scots did inflict some heavy defeats on their foe though, with the goal difference being 64-50 in their favour. J.Maxwell (of Windsor, and later Prahran City) was England's greatest ever scorer with 7 goals. P.Dowker got 5 with G.Brown, Percy Lewis, Hawkes and Frank McIver all getting 3. Jock Baxter led the way for Scotland, netting 9 times. Johnnie Johnstone got 7 with Thompson on 4 and Jim Lurton with 3 next best. From 1970's Soccer Action I see that when the Bill Fleming Medal was run by the press, independent of the VSF and the Rothmans/Gold Medal, there were also press awards for Under 21 VSL Player of the Year and VSL Coach of the Year. I will add these winners to the lineage of their later VPL/NPLV equivalents, as they should be. Maybe in the future the FFV will do the same.